As winter storms approach the Sierra, experts with an eye toward squeezing every possible snowflake from those churning clouds will be watching closely. For the first time, those engaged in the practice of seeding additional moisture out of storms hitting Lake Tahoe are expected to do so with the aid of unmanned aircraft systems, commonly known as drones. “We’re not aware of anyone trying to do this before,” says Adam Watts, an associate research professor and drone expert at Reno’s Desert Research Institute (DRI). DRI, which has seeded Sierra storms to boost water supplies for the Lake Tahoe and Truckee River watersheds for more than 30 years, announced early this year a collaborative effort with Reno-based Drone America and the Las Vegas–based aerospace firm AviSight to explore the use of drones in cloud-seeding operations. The effort is funded by the Nevada Governor’s Office of Economic Development, which is pushing to develop the Silver State as a national leader in drone technology. The state’s assistance is allowing scientists at DRI to pursue a goal they’ve envisioned for several years. “It’s really catalyzed our testing and development efforts,” Watts says of funding that will allow detailed scrutiny into the potential use of drones tasked with sucking extra snow and water from Sierra storms. DRI’s early research into cloud seeding dates back to the 1960s, with an active Tahoe-area seeding operation initiated in 1979, says Frank McDonough, a cloud physicist and manager of the institute’s weather modification program. While some early efforts involved the use of manned aircraft, that practice was discontinued nearly 20 years ago due to excessive cost and the inherent risks associated with pilots deliberately flying airplanes into the teeth of winter storms. 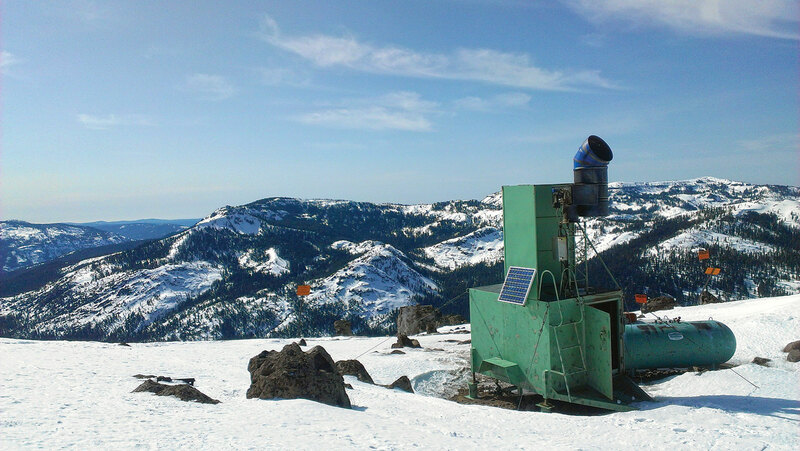 DRI’s current cloud-seeding system entails the use of five ground-based generators, three located on the Sierra Crest and two west of the crest at elevations ranging between 6,500 and 8,400 feet. Seeding of winter storms typically begins in November and can extend into May. McDonough and colleagues are always on the lookout for storms with the proper temperature and climatic and atmospheric conditions to allow for successful seeding operations. Temperatures, for example, must be colder than 23 degrees. Storm clouds must be low enough in altitude. There must be adequate moisture and winds must be blowing in the proper direction to bring those extra seeded snowflakes to the targeted Tahoe-Truckee area. Things need to shape up just so. Once activated remotely, the mountain generators discharge a stream of silver iodide particles—a substance with a molecular structure similar in makeup to ice crystals. The material adheres to tiny ice crystals in storm clouds—ones that otherwise would likely pass over the mountains and evaporate in the atmosphere east of the Sierra—and instead cause them to grow in size, ultimately falling to the ground as flurries. “That becomes your extra snow,” McDonough says. On average, extra snowfall brought about by cloud seeding is estimated to provide an additional 14,000 acre-feet, or 4.5 billion gallons of water, to the Lake Tahoe and Truckee River watersheds, McDonough says. During the winter of 2015–16, the Sierra’s first decent winter after four straight years of drought, the contribution was far more significant. DRI fired up generators 38 times, and McDonough estimates cloud-seeding operations provided an additional 19,021 acre-feet, or 6.1 billion gallons, of water. While cloud seeding has occurred in the Tahoe area for decades, the operation’s financial security has bounced through some uncertain times. After years of funding DRI’s program, a recession-strapped Nevada Legislature cut funding in 2009. The institute pulled the plug on the project, going so far as to begin dismantling the five mountaintop generators before a last-minute request to Reno-area water providers prompted an emergency reprieve and allowed seeding operations to continue. The Truckee Meadows Water Authority and Western Regional Water Commission continue to finance the operation today, providing DRI $300,000 for each winter season. Cloud seeding has occurred in other mountainous areas in the region, but like with DRI, money has been an issue. Beginning in 2010, federal grants to the U.S. Bureau of Reclamation and Walker River Irrigation District funded seeding to boost water supplies in the imperiled Walker River watershed, but the money has dried up, putting the future of that program in question, McDonough says. In eastern Nevada’s Ruby Mountains, a cloud-seeding operation funded by the Southern Nevada Water Authority squeezed out extra winter water for four years, but those seven mountain generators have sat idle since 2013 after funding was cut off. An attempt by the 2015 Nevada Legislature to secure money to renew cloud seeding in the Ruby Mountains and finance the activity elsewhere went nowhere. McDonough acknowledges some critics remain skeptical over the effectiveness of cloud seeding—in part because the practice was exaggerated by some over-enthusiastic supporters dating back to the 1970s. At the request of the Western Regional Water Commission, DRI is in the process of solidifying data to more precisely pinpoint the benefits of cloud seeding. It is doing so with the installation of eight “high resolution precipitation gauges” east of the Sierra Crest, devices that are designed to more accurately measure exactly how much extra snow and water is produced by seeded storms. “It’s like anything else. Any time we can get more precise measurements and be more accurate, it’s easier for us to determine whether the money we are spending is efficient or not,” says Vaughn Hartung, the Washoe County commissioner who chairs the Western Regional Water Commission. Hartung says he is confident cloud seeding is indeed an efficient and cost-effective means to expand precious water supplies so critical to an arid region. Other opportunities to fund seeding may exist. McDonough hopes that, at some point, the Tahoe ski industry will step up and help finance cloud-seeding operations that keep skiers and snowboarders on the move. He says there’s little doubt ski resorts benefit from the added snowfall—particularly resorts that are east of the Sierra Crest, like Northstar California, Diamond Peak and Mt. Rose Ski Tahoe. For several years now DRI has looked at the use of drones as providing “a lot of potential” in improved cloud-seeding operations, McDonough says. During the coming winter, tests are expected to confirm drones as an effective and economically viable method to seed winter storm clouds, agrees DRI’s Watts. Drones, as remotely controlled aircraft, can effectively target particular parts of storms that are most promising to produce snowfall—an opportunity not possible with stationary, ground-based generators. They can be used at lower altitudes and with far less risk and cost than manned aircraft. 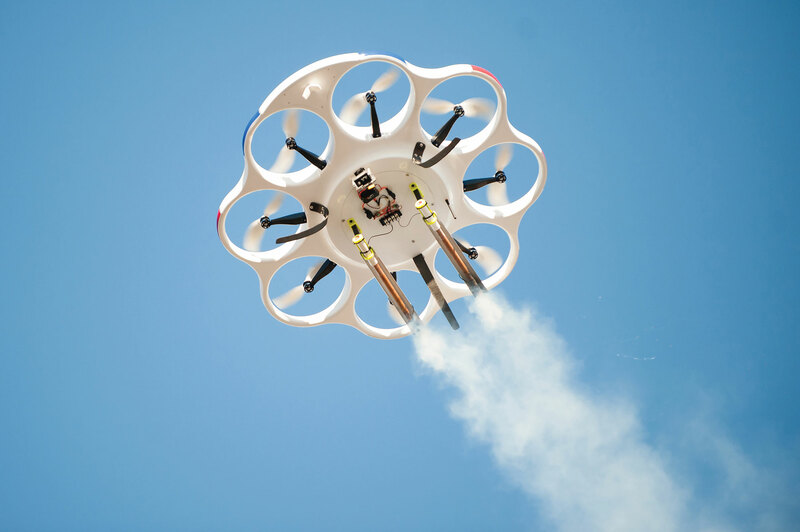 Initial tests by DRI, Drone America and AviSight were conducted early this year and involved the use of the DAX 8, a disc-shaped multirotor drone about four feet in diameter. 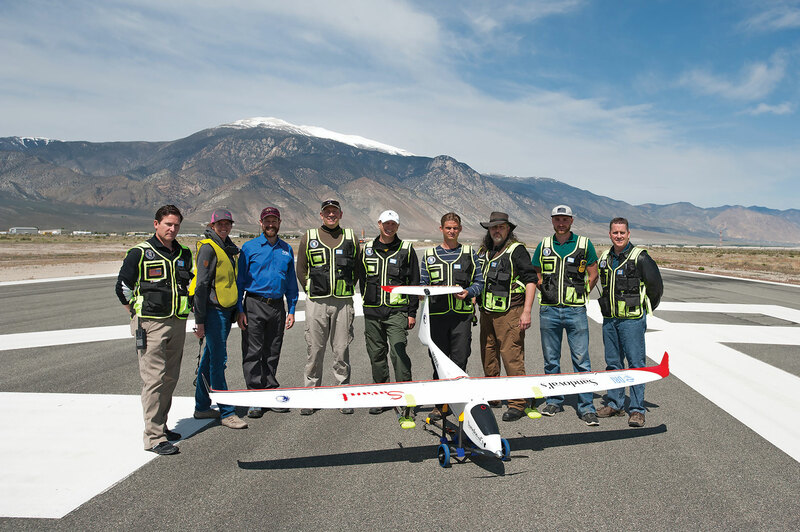 A later test in April involved the Savant, a 6½-foot-long, fixed-wing drone with a wingspan of about 11 feet. During the test, the Savant flew for 18 minutes, reached an altitude of 400 feet and successfully deployed a payload of two silver iodide flares. Tests planned during the coming winter will likely involve the Savant and a larger fixed-wing drone. The unmanned aircrafts will be flown into storms with the idea of proving they can survive icing, high wind and turbulence, says Mike Richards, president and chief executive officer of Drone America. And for the first time, drones could actually seed a Sierra storm cloud, marking an important milestone in a developing technology. “We want to show they can survive those conditions and actually seed the clouds,” Richards says. The potential is there not only to help generate additional snowfall and water supplies for the Tahoe and Reno areas, but also to address challenges with regard to water resources across the planet in the face of a changing climate and extended droughts, Richards says.